A career spanning more than 50 years in the mason's trade came to an end on Thursday of last week, with the retirement of Mr Jack Penfold from Loughborough stonemasons Collin Brothers, of Broad Street. Mr Penfold (65), a married man of 9 Nursery Lane, Quorn, has work for Collin Brothers for 22 years and his retirement was marked by the presentation by managing director Mr W A Collins of a stainless steel spade, an electric drill and a cheque. He entered the trade at the age of 14 and was taught by his father, the late Mr Frederick Penfold, who had his own business in Quorn. Following the death of his father, Mr Penfold ran the business until the outbreak of the 1939-45 war, when he became an Army Meteorological Observer, stationed at the Straits of Dover, where he helped lay smoke screens to cover shipping convoys and harbours. After the war he returned to his trade and worked in Walsall, Staffs., for a time before returning to Loughborough. He joined Collin Brothers in 1955. As a general mason his job has taken him to various parts of the Midlands and he has carried out stonework at Loughborough University, Coalville Grammar School and Southwell Minster Grammar School, among many other places. Another side of the work - one which he enjoyed best because it really gave him opportunity to use his craft - was the restoration of stonework on old buildings. Among his favourite jobs of this type was the restoration of Barleythorpe Manor, near Oakham. 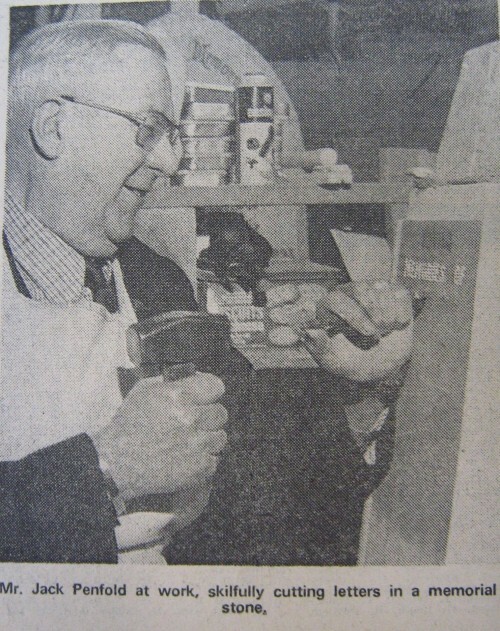 Much of Mr Penfold's time has been spent in putting the lettering on headstones for graves and he calculates that he has carved an average of 8,000 letters a year throughout his career. Even though he obviously forgets the names of the hundreds of people he has provided headstones for, he can always recognise his own work when he sees it. "Its like handwriting - no two men do it quite the same," he said. He added "I have enjoyed every day of my working life because I love my work. The tools we use today are more sophisticated but the work of a stonemason is basically exactly the same as it was when the pyramid were built". Mr Penfold plans to use his retirement to concentrate on his two main hobbies, gardening and woodwork. His employers have the problem of replacing a master craftsman of great experience but, as he pointed out, "A youth who is prepared to work hard will find that he can't go wrong in this trade. I have never had a day out of work in my life and there have only been 13 weeks without overtime since I joined Collin Brothers."